Limestone and dolomite in the Salt River Range of western Wyoming. 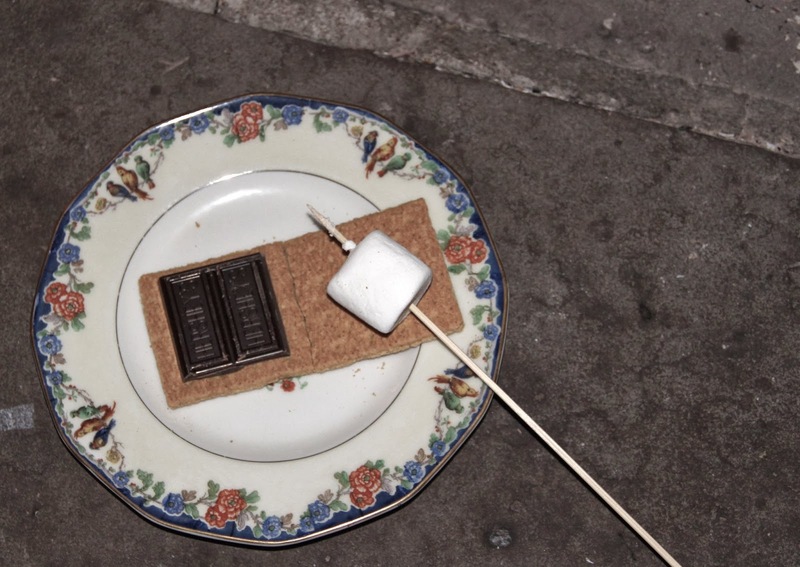 Photo by Hollis Marriott. Shultz’s milkvetch (Astragalus shultziorum) grows in abundance on calcareous scree and rock outcrops in the Salt River Range (above), but overall it's rare. 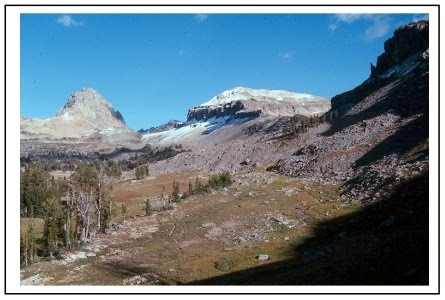 It's restricted to several mountain ranges in western Wyoming and adjacent Idaho, and specifically to sites underlain by limestone or dolomite (images courtesy WYNDD). 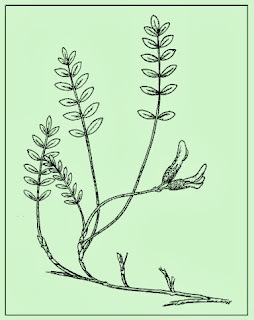 Shultz's milkvetch, by Walter Fertig. 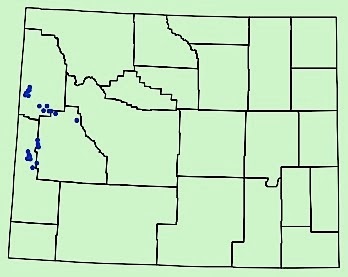 Distribution of Astragalus shultziorum in Wyoming. In Wyoming, we have at least twenty species like Shultz's milkvetch -- restricted to limestone or dolomite. Why? What’s different about these plants? This is the “limestone question" which has intrigued and puzzled botanists for more than 200 years. We call these species calciphiles or limestone lovers, though we really don’t know what we’re talking about (more on that later). They’re endemics, meaning restricted to a limited area, and they're edaphic endemics as they occur only on specific soil/rock types. Calciphiles are edaphic endemics that grow only on calcareous sites ... or so it appears. 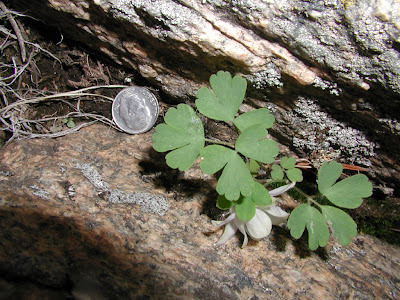 It’s impossible to be a rare plant botanist in Wyoming and not be enchanted by our calciphilic plants. They're often found in spectacular places, and the association with specific rock types is fascinating. Shoshonea in foreground, on rocky calcaerous soil on Bald Ridge along the east flank of the Absaroka Mountains. 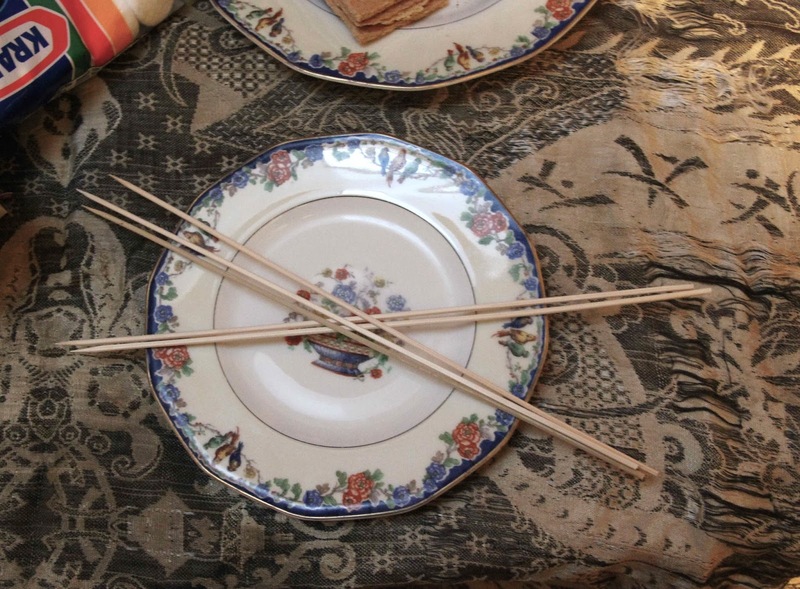 Photo by Hollis Marriott, courtesy WYNDD. 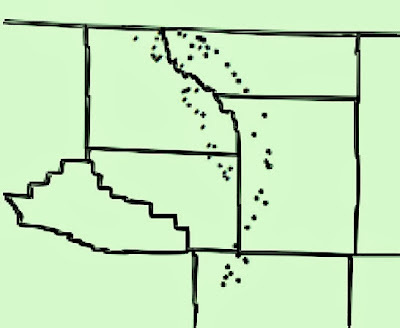 Shoshonea (Shoshonea pulvinata) in Wyoming. 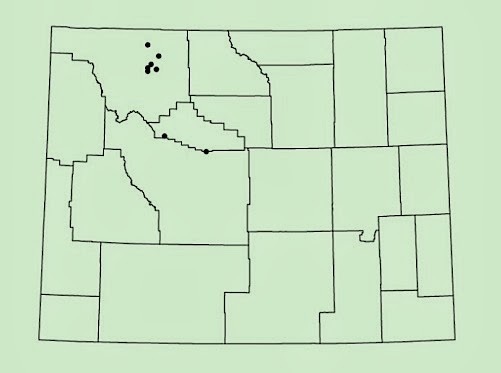 It's known from sites in south central Montana also. Limey home of Dorn's twinpod; photo by Walt Fertig, courtesy WYNDD. In the photo above, Dorn’s twinpod (Physaria dornii) grows on gravelly slopes of Twin Creek limestone with mountain mahogany. 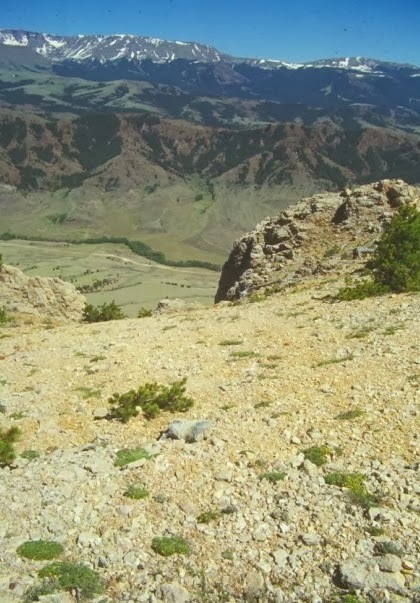 This twinpod is a narrow endemic limited to a few areas in central west and southwest Wyoming. 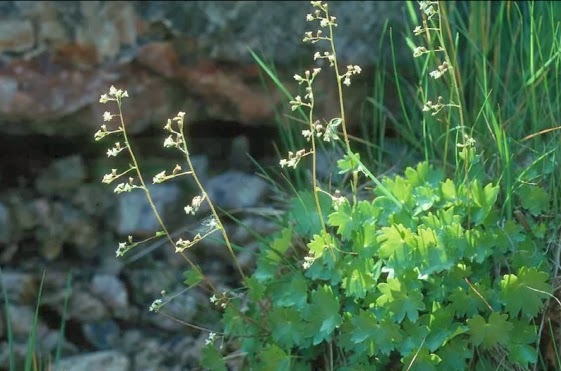 In the northern part of its range it grows on limestone soils. Further south it does just fine on sandy-shale soils. Are these genetically-distinct ecotypes? 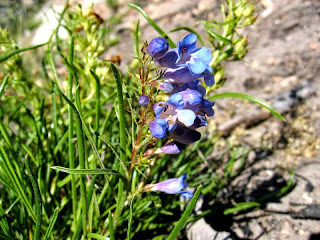 Below, Cary’s beardtongue is one of the half dozen or so calciphilic endemics of the Bighorn Mountains, where there's lots of limestone and dolomite. Penstemon caryi; photo by Andrew Kratz. Why are we blessed with so many calciphiles? It’s because limestone and dolomite are exposed in most mountain ranges in the state. 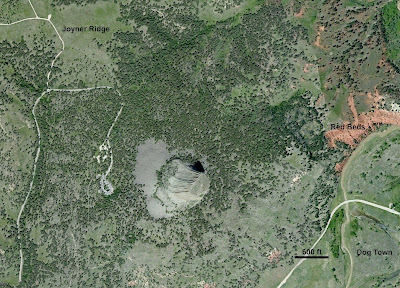 During much of the Paleozoic Era 570 to 245 million years ago, Wyoming was underwater. Sand, silt and most importantly, carbonate sediments were deposited on the sea floor. 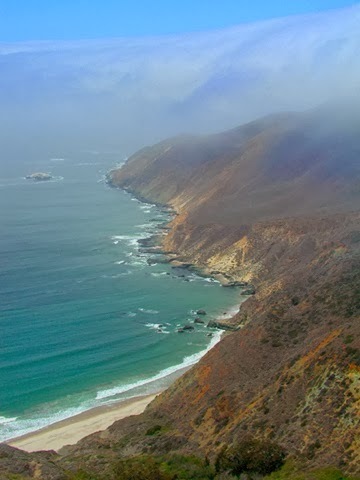 Time passed, the sediments were buried and turned to rock, and then starting about 70 million years ago, mountains were uplifted and erosion exposed outcrops of calcareous rock. 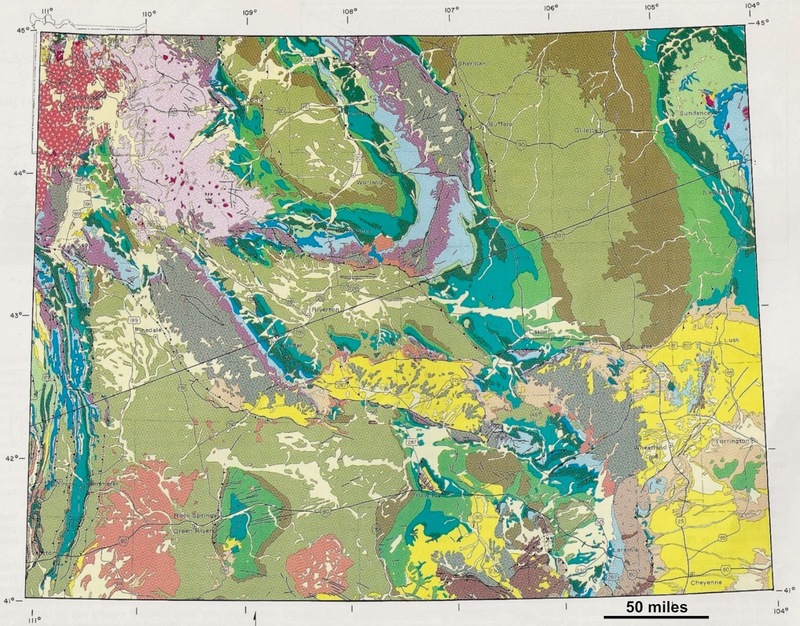 Above, simplified geologic map of Wyoming. 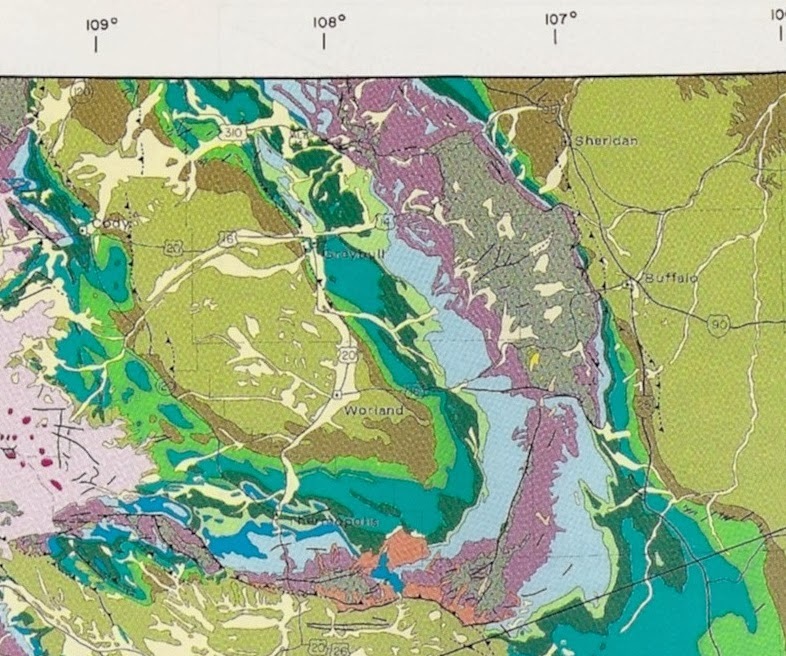 Purple and pale blue areas include exposures of Paleozoic limestone and dolomite. Below, cross-section through Wyoming mountain ranges; Paleozoic rocks are pale blue. Click on images to view details; both are from Roberts 1989. 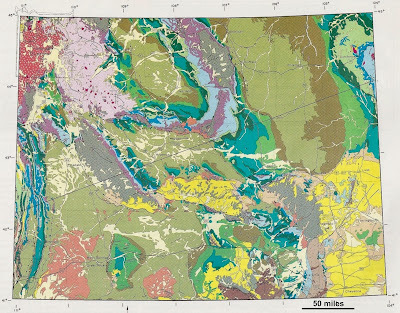 The map above shows the surface geology of the Bighorn Mountains in north central Wyoming. The purple and light blue polygons include extensive exposures of limestone and dolomite. Below, distribution of three endemic plant species reflects distribution of calcareous rock outcrops and soils. 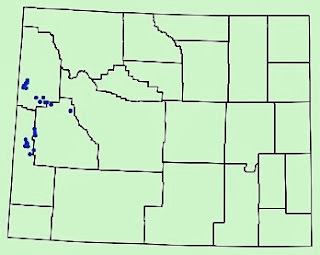 Distribution of William's waferparsnip (Cynmopterus williamsii), Cary's beardtongue (Penstemon caryi) and Hapeman's sullivantia (Sullivantia hapemanii) in the Bighorn Mountains. All are endemic to limestone. Hapeman’s sullivantia (Hapemania sullivantii) is an unusual Wyoming calciphile. It grows in moist-to-wet habitat, while most of our limestone endemics occur on dry sites. 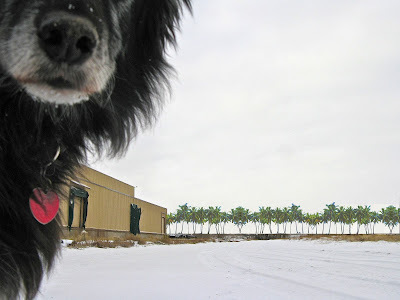 Photo by Bonnie Heidel, courtesy WYNDD. The limestone question pops up in many parts of the world. It's been studied extensively in Europe, starting with botanist and plant physiologist Franz Unger. In 1836 he published a paper contrasting the distinctive floras of limestone vs. slate regions in the Alps: Über den Einfluß des Bodens auf die Verteilung der Gewächse (On the influence of soil on the distribution of plants). 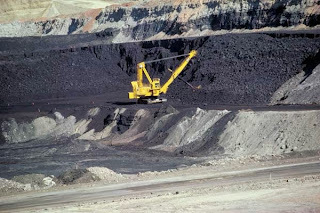 Unger viewed the mineral composition of the rock as the main determinant of substrate-specific plant distribution, sometimes called the Chemical Soil Theory. The Dolomites in northeastern Italy. With so much calcareous habitat it must be a wonderful place! 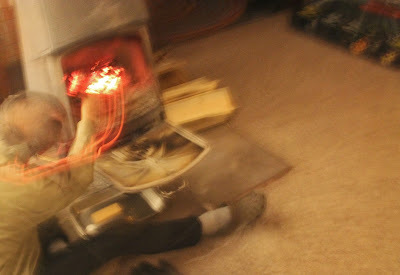 Photo by Ken Driese (The Booby Hatcher), used with permission. 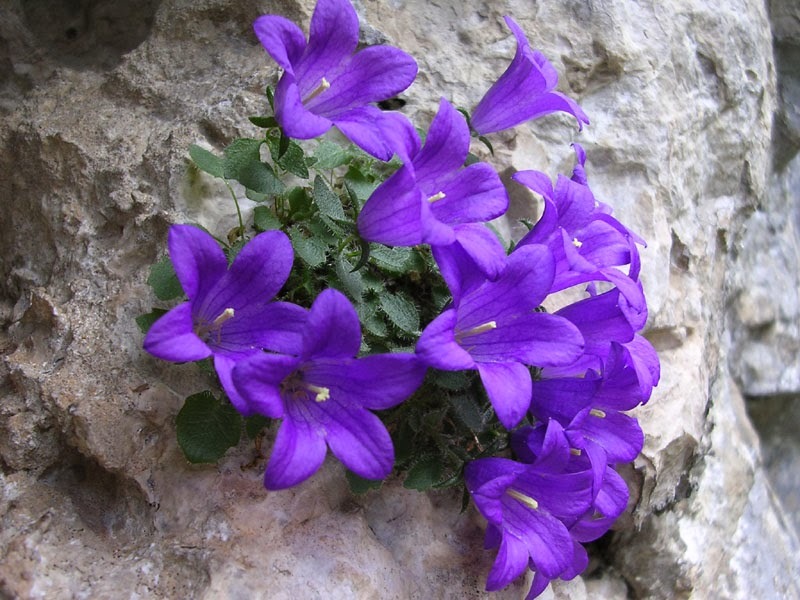 Dolomite bellflower (Campanula morettiana), one of many endemics in the Dolomites. 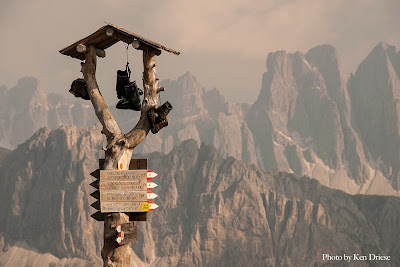 From Dolomiti Bellunisi National Park. Cedar glade on limestone in Tennessee. 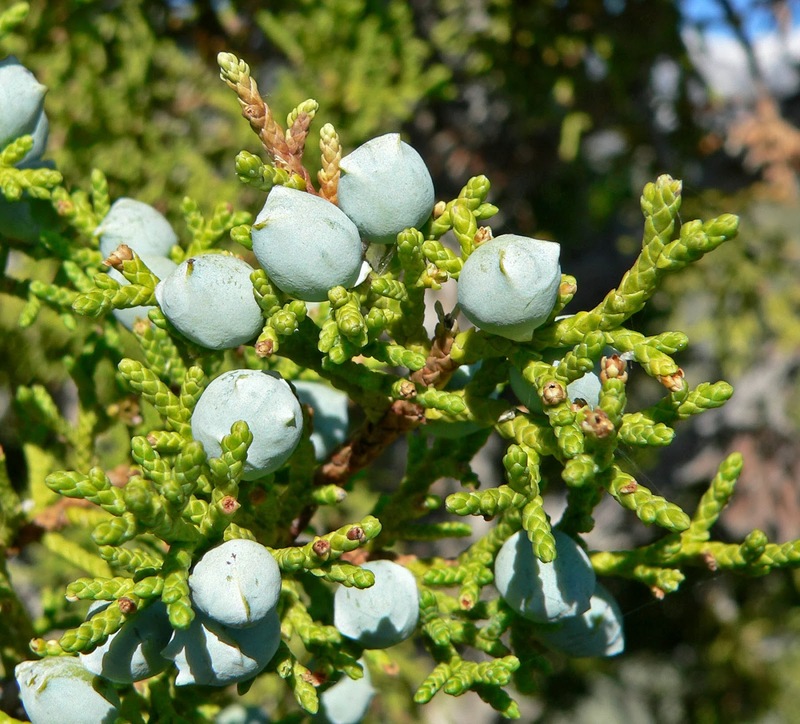 The cedars are Juniperus virginiana. Source. Limestone areas often are rich in endemic plant species. 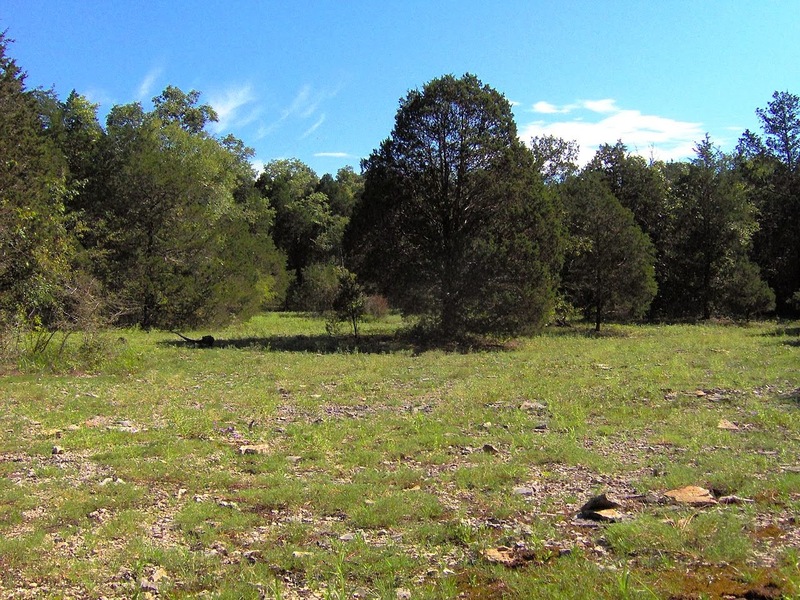 For example, in the central eastern USA, cedar glades develop in areas of shallow rocky calcareous soils and exposed bedrock (above). The flora of these glades includes 41 endemic species! (Kruckeberg 2002). At least a dozen calciphilic plants are known to be endemic to Mount Olympus, Greece (Kruckeberg 2002). Mytikas, highest peak of Mount Olympus (source). 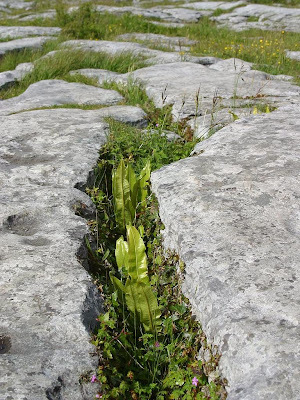 The Burren in County Clare, Ireland, is one of my dream destinations. It’s famous for its amazing flora, including many limestone-lovers. Plants thrive in grikes (solution fissures) in limestone pavement in the Burren. Source. basiphile vs. acidophile -- plants adapted to basic vs. acidic soils. For a long time it was assumed that the differing pH of soils derived from calcareous rocks (slightly basic) vs. silicic rocks (slightly acidic) explained plant distributions. It turned out to be not so simple ... in fact not even close. 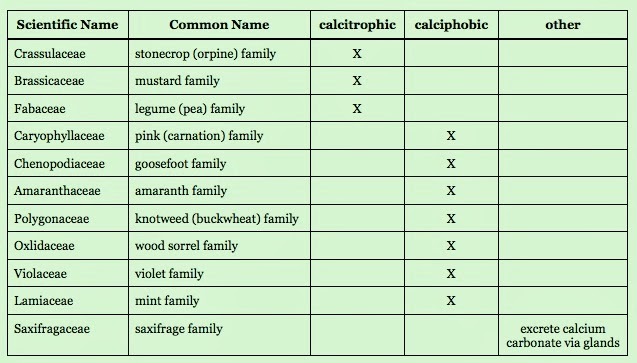 calphile vs. calciphobe -- plants requiring (loving) vs. unable to grow on (fearing) calcareous substrates. This too is an oversimplification. Many limestone lovers will grow just fine on non-calcareous soil if there’s no competition. Apparently in the wild they’re restricted to limestone because the competition can’t grow there. 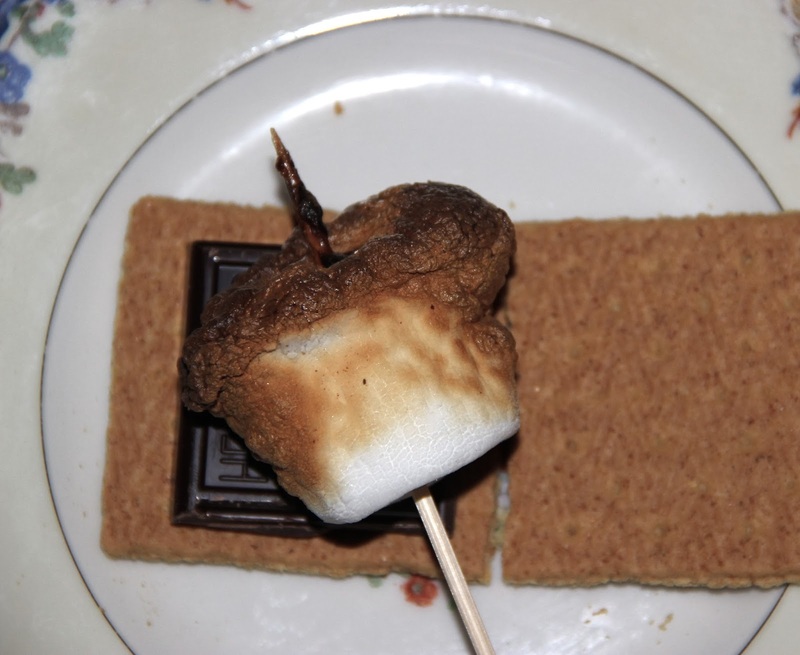 calcicole vs. calcifuge -- plants that grow vs. do not grow in calcareous habitat in the wild. This non-committal approach is good because for most species we have no answer to the limestone question. But we’re not totally ignorant ... we’ve learned that plants deal with the challenges of limestone and dolomite in diverse ways. Limestone is mainly calcium carbonate; so is dolomite, but with magnesium mixed in. It’s not surprising then that one problem with calcareous habitat is too much calcium. Plants need calcium but an overabundance disrupts critical processes. Several strategies for dealing with excess calcium are known. Some plants are able to maintain high concentrations of bound calcium in their sap without altering the concentration inside cells. These are calciotrophic calcicoles. There also are calciophobic calcicoles which precipitate out excess calcium and store it. Other plants secrete calcium carbonate via glands. 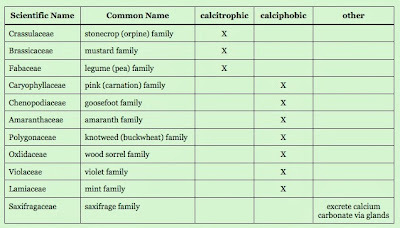 The table below shows plant families in which some species are calcicoles, with strategies. Based on information from Kinzel 1983; click on table to view. It may be that some plants tolerate limestone with the help of microbes or mycorrhizal fungi associated with their roots. Finally, a plant’s apparent love of limestone may have nothing to do with calcium. White and Broadley (2003) suggest that it is “insensitivity to iron and phosphorous deficiencies that determines the flora of calcareous soils.” And so the debate rages. 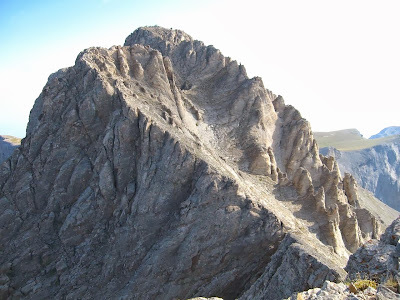 Though we're blessed with many calcicoles in Wyoming, the limestone question -- why and how they grow where they do -- has not been answered for any as far as I know. And so we arrive back where we began -- fascinated and puzzled, and hopefully a bit wiser for the journey. 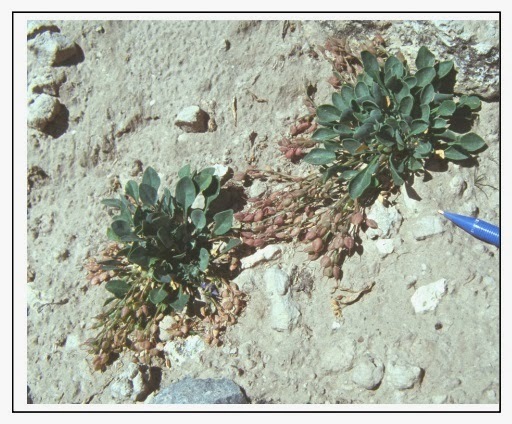 Above and below, Payson’s bladderpod on calcareous soils in the Salt River Range. Is it a limestone lover? a calcium addict? 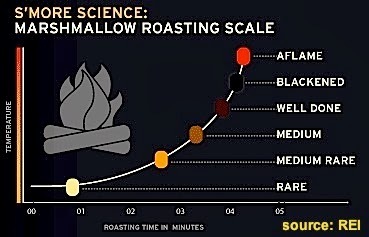 a calciophobic calcicole? We can only wonder. 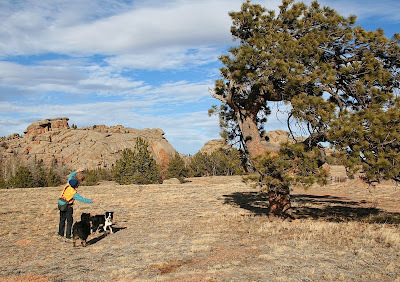 Photos of Lesquerella paysonii and habitat by Hollis Marriott, courtesy WYNDD. This post is my contribution to the December Accretionary Wedge (#63) -- Plants and Rocks (or Rocks and Plants). Kinzel, H. 1983. 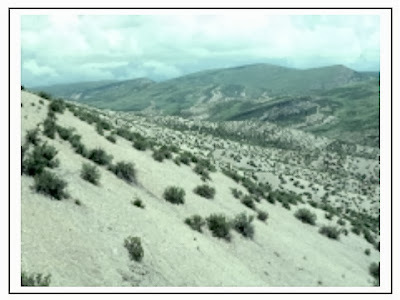 Influence of limestone, silicates and soil pH on vegetation. in Lange et al., eds. Physiological plant ecology III. Springer-Verlag. Kruckeberg, AR. 2002. 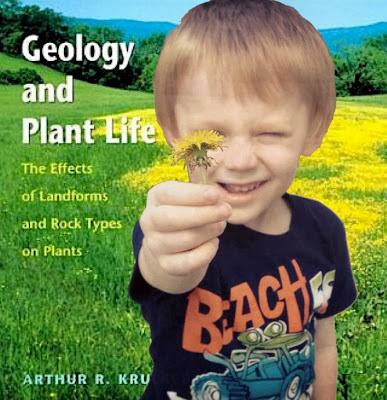 Geology and plant life. The effects of landforms and rock types on plants. Seattle: Univ. WA Press. Roberts, S. 1989. 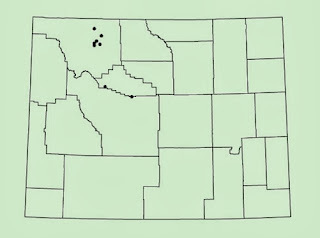 Wyoming geomaps. Laramie: Geol. Surv. WY. White, PJ and Broadley, MR. 2003. Calcium in plants, review article. Ann. Bot. 92:487-511. California coastal chaparral on Point Sal ophiolite, Point Sal State Park. What would you do if you were a tree? What's wrong with this picture? (Laramie, Wyoming; click on image to view). Like most plants, trees are powered by the sun. Leaves are their solar collectors, and inside them are little powerhouses and factories (chloroplasts) where sunshine, carbon dioxide and nutrients are made into carbohydrates for life and growth. Obviously leaves are hugely important to a tree, but they aren’t always a good thing. In fact where winters are cold, they're a liability. They could freeze, or trap snow and break branches. So what to do? 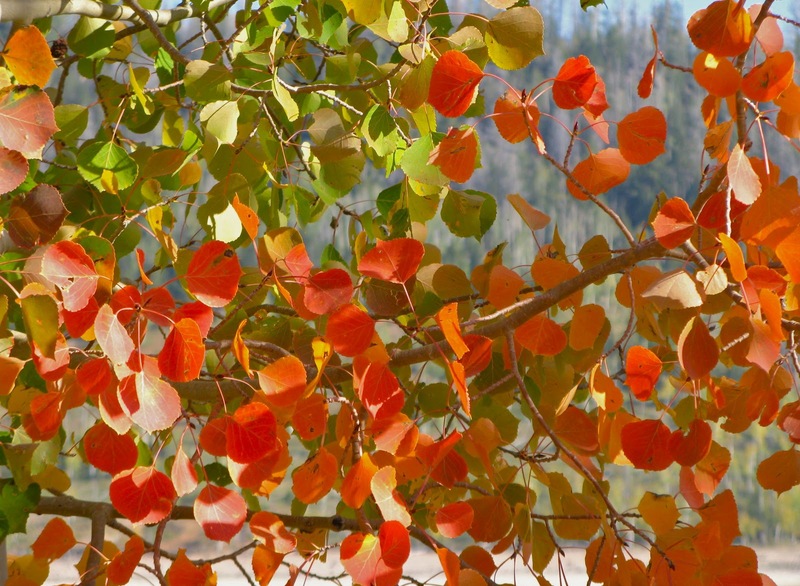 Deciduous trees toss their leaves each fall but then must produce a new set in the spring. This seems wasteful and costly. 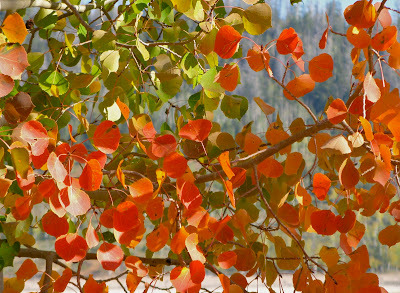 Every fall, quaking aspen (Populus tremuloides) kills it leaves by starving them, a pretty but brutal process. Evergreens keep their leaves all winter. 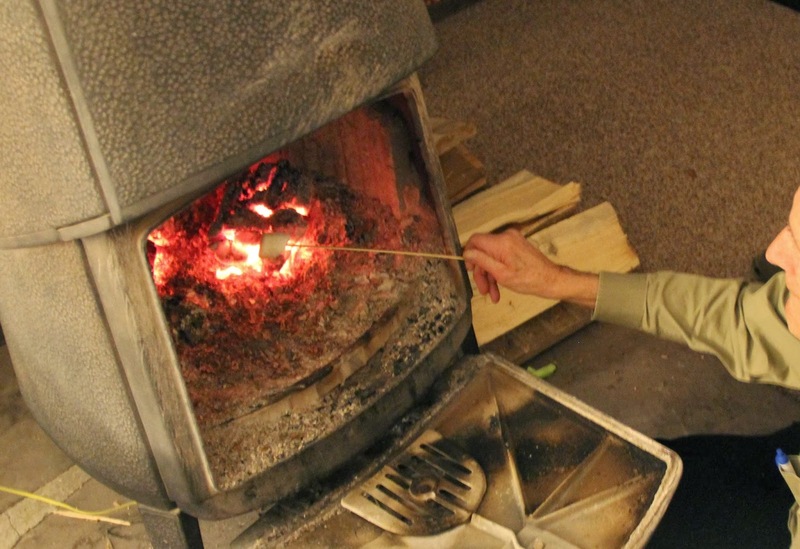 They’re ready to go first thing in the spring, but isn’t this a bit risky where winters are long, cold and snowy? 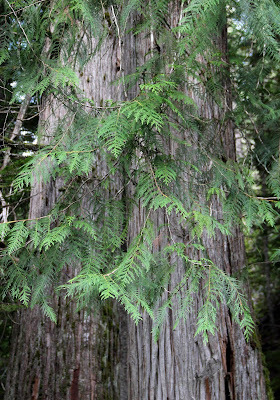 Western red cedar, an evergreen conifer, keeps its beautiful needles year round. *Gymnosperms and angiosperms are two evolutionary branches within seed-producing plants (spermatophyes). 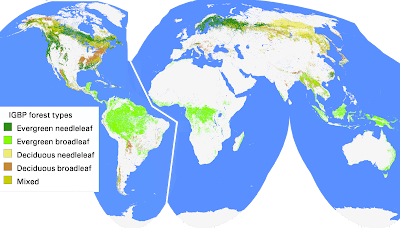 Next, a map showing forest types of the world (source). 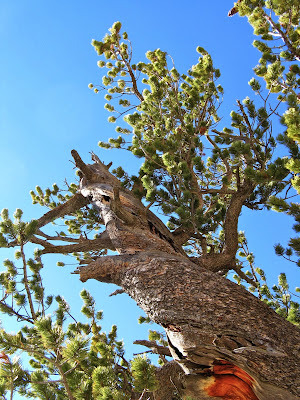 Trees can help us pick a strategy because there’s a pattern to their distribution ... a gross over-simplification of course, but close enough to reality to let us ponder why different types of trees grow where they do (“needleleaf” is equivalent to “conifer”). In a sense, the ideal place to live is where it never freezes and there’s always adequate moisture, for example the tropics. In these places a tree can grow year-round, so it’s not surprising that most tropical trees are evergreen. Furthermore, they’re broadleaved. It’s worth investing in large thin leaves that maximize sunlight and carbon dioxide uptake. Highly-productive leaves mean faster growth to compete for sunshine. Evergreen leaves do die and fall off but not all at once. There’s always plenty to feed the tree. Left, Shorea sp., a canopy species of tropical forests in Borneo, from Landmark Trees. Of course evergreen broad leaves would be a poor choice where the climate is seasonal. They aren’t hardy enough. Deciduous is a better strategy -- drought-deciduous in deserts, cold-deciduous where winters are harsh. 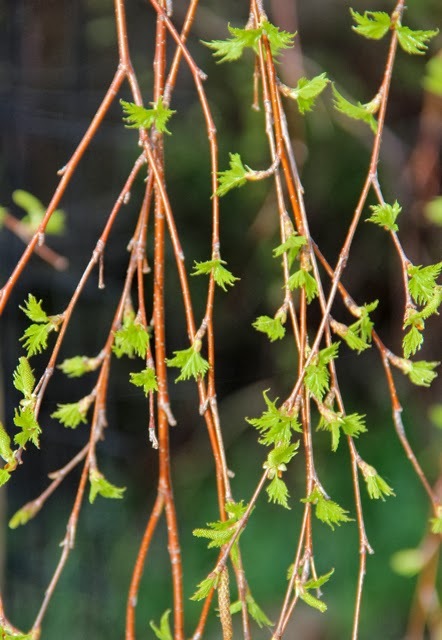 The cold-deciduous weeping birch (Betula pendula, right) produces a new set of thin highly-productive leaves for the growing season, tosses them in the fall, then goes dormant and rests over the winter. 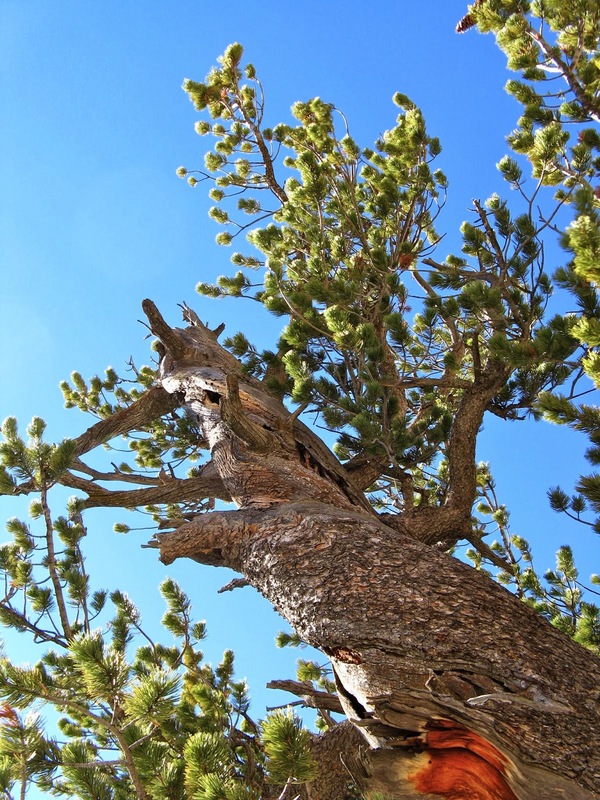 Limber pine (Pinus flexilis) in the Laramie Mountains, Wyoming. Where growing seasons even shorter and winters are long and cold, evergreens again dominate but these are conifers, with needles or scales instead of broad leaves. They’re smaller, hardier, more frost resistant, but not nearly as productive. Still, being evergreen they’re a better choice overall. 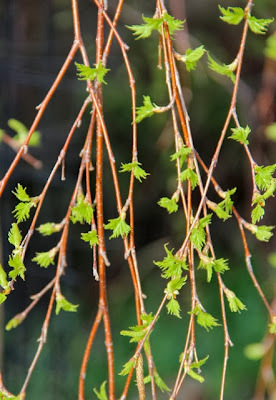 There’s no need to grow new leaves every spring. A tree can get on with the business of photosynthesis right away. Juniper scales and berry-like seed cones (source). Then at the very northern limits of forests we find ... a big surprise! Mother Nature has thrown a twist into our nice sensible pattern of forests types. Often it’s deciduous trees that dominate the northernmost forests (note yellow and orange patches in the far north in map above). 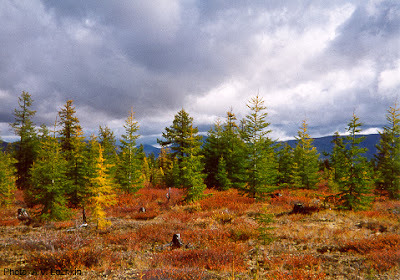 In Asia, these are mainly deciduous conifers (larches). In North America, they’re more often broadleaved species -- poplars, willows and birches. Dahurian larch, Larix gmelinii, makes up extensive forests in eastern Siberia (source). 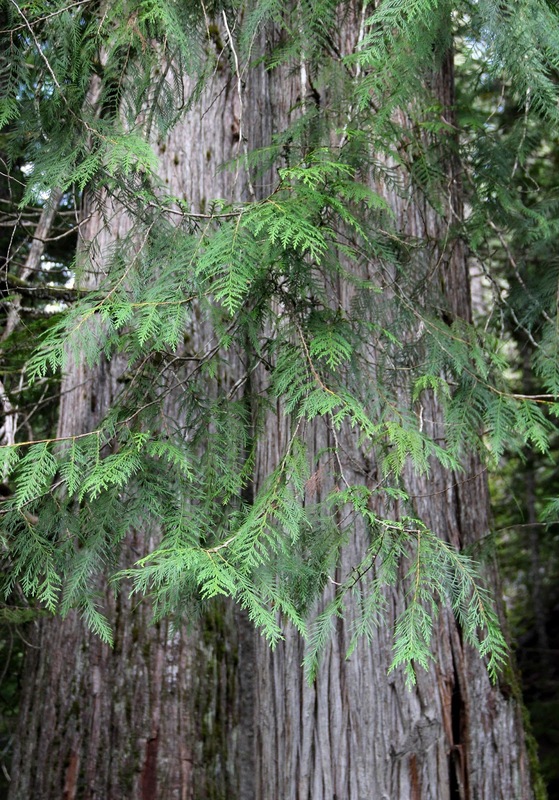 UPDATE (source): Dahurian larch grows further north than any other tree, and probably is the most abundant conifer on earth. What kinds of adaptations allow trees to live where growing seasons are so short, and winters so frigid? Some can export water from cells into inter-cellular spaces, where it then freezes. Once in this state, tissues can survive temperatures at least as low as -196º C! (Thomas 2000). So evergreen or deciduous, broad leaves or needles ... which would you choose? I would be an evergreen conifer so I wouldn’t have to go do the intensive-growth-thing. Summers are too short ... I want as much leisure time as possible! Tree impersonation, a popular plant-geek pastime. This is the final post in a short series about autumn tree strategies. Havranek, WM and Tranquillini, W. 1995. Physiological processes during winter dormancy. in Smith, WK and Hinckley, TM, eds. Ecophysiology of coniferous forests. Academic Press. Thomas, P. 2000. Trees: their natural history. Cambridge University Press. 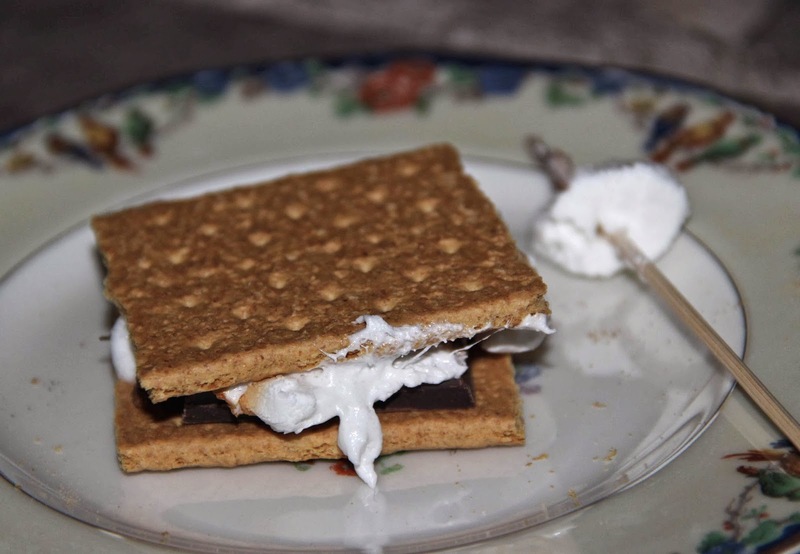 Ingredients: graham crackers, chocolate bar, marshmallows. cover with second cracker and gently mash. 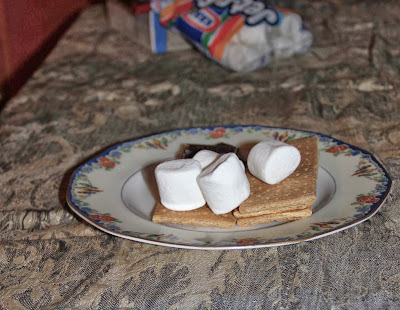 Maybe this is a first’un and the next ones will be s’mores. 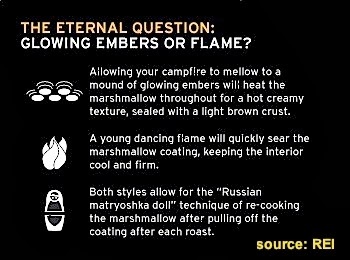 For more on s’mores, see this excellent infographic by REI (however, it doesn't address the existential question of a first s’more). Photos courtesy Arthur Kruckeberg and Dan Poelma. I’m hosting December’s Berry Go Round, a carnival for plant bloggers. In my solicitation for posts I tried to encourage geo-bloggers to participate, as botany and geology often interact or are linked in some way. Then I noticed that the Accretionary Wedge #63 geo-carnival was host-less. I thought ... why not both? My topic, Plants and Rocks or vice versa, was accepted making this the Bargain of the Year! You can submit your AW contribution to the December BGR too. To submit a post to the Accretionary Wedge, provide a link in a Comment below or tweet to @plantsandrocks. UPDATE: Deadline is the end of the month. 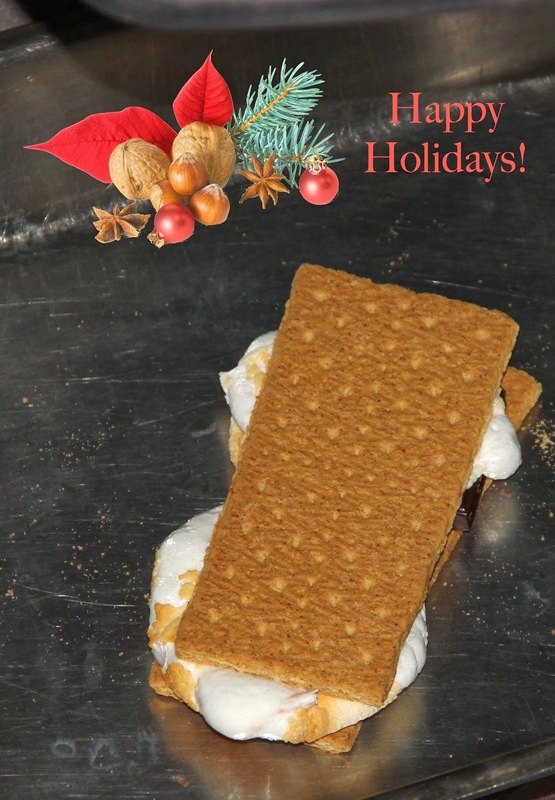 To join the December BGR, see the solicitation post for details. 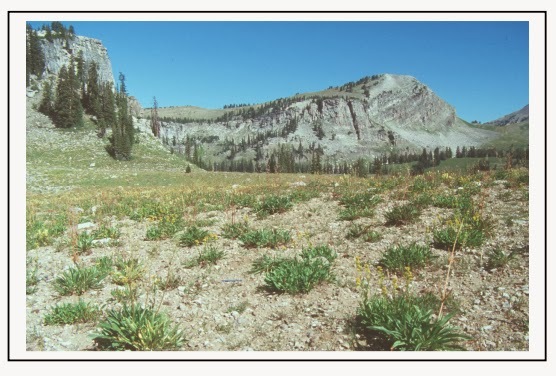 Cary's beardtongue grows only on calcareous sites in the Bighorn Mountains. Photo by Andrew Kratz. Grassland - forest mosaic determined by bedrock; Devils Tower, Wyoming. 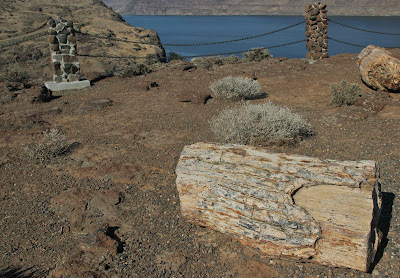 Petrified Miocene logs, eastern Washington. Mining the remains of sub-tropical trees in the Powder River Basin, Wyoming. Laramie columbine on Laramie granite. ... as do rocks and plants. 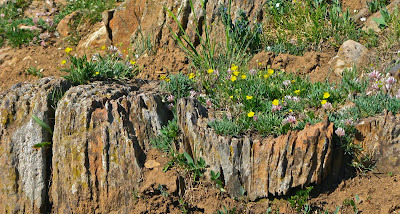 Precambrian stromatolites decorated with alpine wildflowers.